9 times out of 10 I’ll recommend to a client to host their video content on YouTube and then embed rather than self-hosting. My reasoning is fairly obvious… a) You get free video hosting from the most robust servers in the world. b) You get to extend your content into one of the largest online communities in the world. However, every once in a while you don’t want your video to be public. Maybe you have some really specific content where you want to capture contact/lead information before granting access. Then, what if you want to see if the lead actually watched your video. Sure Google Analytics can track the page the video is sitting on, it can even tell you the average time a user spent on the page. But there’s no easy way to tell how much of the content they actually watched. Though we could manually create a movie player in Flash, and then setup some event tracking scripts to report back to Google Analytics, this is not a very efficient method. Enter the JW Player by LongTail Video. It’s been around for a long time and is one the best tools for self-hosted video. Aside from making it really easy to stream via Flash or HTML5 (for iOS or other non-Flash devices) it also allows for several add on features. 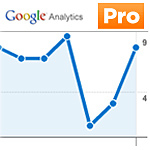 While there are other noteworthy add-ons available, what I want to talk about here is the Google Analytics Pro add-on, which, not surprisingly is their most popular. Not only can it tell you which videos are being viewed but it can also tell you how long a user watched each video. After you’ve got the video player up and running (which is pretty easy and I recommend using the .mp4 video format with H.264 and ACC for cross compatibility) all you need to do is make sure that your Google tracking snippet is on the page with the video and then have the plugin parameter set in your JW Player embed snippet (instructions are included in the guide). Once everything is setup and you’re logged into Google Analytics choose “Content”. Then go to “Event Tracking”. From here you can see your video traffic. Then depending on what tracking options you choose you can view “Video Plays”, “Seconds Played”, and “Percentage Played”.